While reading a post by Syl, from Raging Monkeys, I found this other interesting post written by Chris of Game by Night. Chris tells about his difficult in playing an asura thief since ArenaNet did such a good job of giving each race a strong sense of culture. Due to that he just finds it hard accepting an asura as anything but as an engineer. With other races he has similar problems but with different professions. I was going to comment about it on his blog but sensing that it would end up turning into a wall of text I thought it might be better to turn it into a blog post instead. Anyway, I don't know if it is because I have a weird mind or what but I don't find it that difficult to justify any combination of race and class. Making it sound interesting or unique without it feeling convoluted might be hard but simply justifying an off-beat combination of race and profession, not so much. Let's start with the easy ones, the Sylvari. They are a very young race, being only 20 years old. That is very little time to develop much of a culture of their own or establish strong traditions. They also have a strong sense of curiosity so I can see them trying pretty much any profession as long as it isn't extremely cruel to others. Next up are the charr. They have the Blood Legion, consisting of front line soldiers, the Ash Legion who prefer the use of subterfuge to get the job done and the Iron Legion who are the ones who come up with all the machinery and guns for the charr. You can choose to be part of any of the three during character creation. The first one is pretty much what you would expect of a a race of big furry, militaristic, cat-like creatures. The other two are more unusual at first but they also follow the same militaristic attitude as the rest of their race. So a charr thief or a charr engineer isn't that unusual. A point that was raised in the comment sections of Game by Night was whether then certain professions would fit with certain legions. I think it is possible and here are some examples off the top of my mind. A thief could be part of the Blood Legion, thinking it would be an easy way to go up through the ranks by manipulating the "dumb" blood legion for his own ends. Perhaps by falsifying reports about his feats that couldn't easily be contested. Something that could be harder to do in the Ash Legion as they probably would be used to that kind of stuff. While a warrior in the Ash Legion could be more of the "street thug" type with the leaders of the Ash Legion using such warriors for when they need to send a clear message to one of the charr enemies but would rather use one of their own instead of asking favors to the Blood Legion. A necromancer could be part of the Iron Legion, studying the ghosts of Ascalon to create better devices so the Legion could get rid of them. While in the asura everyone is pretty much an engineer from birth, not everyone can simply live off inventing new things all day. Some of them needs to hold what little laws they have or fend off threats to the asura. Those would be the Peacemakers, the guards of asura society. Warriors or guardians could come out of their ranks. If you'd rather not have an asura warrior tied to their military, you could always use their naming culture for it. In asura society anyone who doesn't have double letters in their name are mocked by their peers as they grow up. Perhaps your asura grew so bitter from the experience that the only way they can express themselves would be by extremely violence, preferably with their own patented B.A.S.H.E.R. 9000. While the elementalists and necromancers could be like our real world physicists, people dealing directly with energies or theories that other people would find too ephemeral to think about. Rangers could be the ones who collect live specimen for studying while thieves being the type who prefer to save time by "borrowing" common parts from other krewes to build their own projects. Norns could work out with different professions too. A thief norn could be a cheater who lies and do anything in his power to make himself look more legendary. In fact, one of the norn character creation choices is of a rival who did cheat against you! A norn engineer is entirely possible too. He could try to be figuring out new weapons to hunt down prey that would be otherwise impossible for a norn. Crafty is something the norns appreciate too and engineering in my view would fall under that. A mesmer could also be a very crafty hunter using his powers of illusion to tricky prey into a trap. An elementalist could be a shaman using his direct line to the spirits to bring the forces of nature to his aid. Necromancers I admit it is a little harder if you don't want to go the cliche of "lost loved one, turned to dark arts to revive him or her." Perhaps they could also be a sort of shaman too but more of an amoral type who instead of serving the spirits seeks way to enslave them to his will. In the end we always need to keep in mind that in any society there will always be individuals that go against the norm of their culture. Some times it is a harmless thing, other times it ends up in terrible deeds while in other cases it can end up turning into a force for positive change and progress. As pointed out in the comment sections of Chris' post, this is exactly the case for our characters. This may be hard to see given that there are so many other players in the world doing cool stuff too and the NPC population not being nearly as large. But if you consider that the NPCs professions as the norm for Tyria's culture, the merchants, the innkeepers, the soldiers who patrol the roads day and night, etc, our characters are extremely exceptional. Not simply by the circumstances they start in but also because they will eventually be facing dragons. I don't think that is a prospect most of the population of Tyria would look for or be willing to deal with. It is something that will be up to the exceptional citizens of Tyria to do, those being our characters, so that the rest of the world can be safe and continue living their lives as they are used to. I tend to think of the character's class as being more "my style of fighting" than "what I do for a living". So a character who is a thief doesn't necessarily steal things, but he is a light mobile fighter who uses trickery to gain an edge. I have absolutely no problem with a charr or norn picking that as a fighting style - especially, for the norn, one who reveres Raven or Snow Leopard. Being a Raven adherent, with their love of wisdom and trickery, would explain norn mesmers and necromancers too. 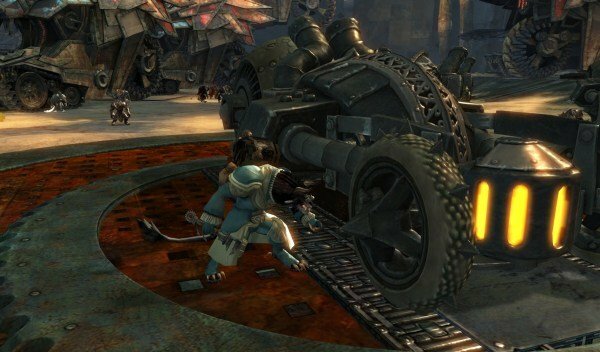 Ele is the first profession that comes to my mind for asura because they specifically deal in magical technology. Plus Vekk in the original was an ele, as is Zojja now. My asura ranger does feel like a stretch just because asura have such little regard for other forms of life. On the flip side my charr engineer feels too cliché, and I always wanted a charr ele, but engineer seemed too weird for norn. Then there's orders and armor to consider, and everything else. And now you're making me second guess my norn ele and charr engineer again. The only constants have been my main and my thief. On a related note, I don't even know what to make of a particular sylvari in the personal story who's a necro and on a mission to heal Orr, as if summoning nightmares in defense of the dream isn't strange enough. There's against type, and then there's just plain counter-intuitive. I haven't met that sylvari necromancer yet since my sylvari is yet barely outside the tutorial part. But I agree about it seeming counter-intuitive, it is one of those cases where it feels overtly cruel for a sylvari and something that goes against what the Pale Tree teaches them. My characters always end up kind of weird in every game that I can always make them fit in somehow. I tend to view them kind of like secret agents infiltrating world cultures. Like the Asura I recently made, I see her as very gnome-like based on her history in EQ2, so even though she is a necromancer (in both games), I chose the explosion route with her during character creation because what gnome doesn't like to blow things up, even if accidentally? So even though she's not a gnome in EQ2, it fits her personality and fits her into the Asura culture to an extent in GW2. Concerning Aly's Sylvari necromancer comment above, I could easily view a Sylvari necro in a very shamanistic way, kind of like the Ashland tribes in Morrowind with their ancestor-worshipping rituals. Not that Sylvari would use it an ancestor-worship way like those Dunmer, but instead in a cycle of life, nature-oriented way. Plants decompose and feed nutrients to the soil so that healthy new plants can grow. I hear ya. It took me a few days to make my first Guild Wars 2 post after release and I have been trouble prying myself from it to play anything else! Hm. That is something I could accept too but the thing is necromancers in Guild Wars 2 summons some pretty scary undead creatures. The kind that would scare most people. On the other hand silvary can be pretty oblivious to danger and social norms, so they probably would see one of those undead and try to learn more about it rather than run away in terror. Plus there is also the fact necromancy seems to be a pretty much accepted art in Tyria. I am still shocked about the kid I saw talking to his dead about not wanting to be a necromancer in Divinity's Reach. They were doing it so casually and in the middle of a public street too! In fact, in the GW2 book Ghost of Ascalon, one of the heroin is a Sylvari Necromancer. She explains that Sylvari are very interested about the nature of death, does not find the body disturbing - at one time she raise human bodies of her comrades and everyone say "No please no !" and she asked naively what is the problem. *nods* I've been meaning to buy that book and Destiny's Edge. Guess I should stop procrastinating and do it now since the game is live and would make it easier to understand a few things. I'm really glad GW2 doesn't restrict players to only the most obvious race/profession combinations, and lets players be as creative as they want. While some combinations might be a challenge to explain, some of the most interesting and memorable characters are those that run contrary to all expectations. So much better than the boring pigeonholes of elf rangers, dwarven warriors, etc. Remember shy retiring Bilbo Baggins was hired as a hobbit thief. Merry and Pippin, the hobbit companions in Lord of Rings, ended up returning home as hobbit warriors. Ettesiun already pointed out Killeen, the Sylvari necromancer in Ghosts of Ascalon, who is both believable and little scary in her not-quite-human callous interest in death. It's ok to think out of the box. Indeed! I am highly biased towards the more non-standard combinations of races and classes. But I also don't mind the ones who are more of the standard fare as long as they are well done. For instance, Rytlock is pretty much THE charr warrior but I doubt anyone would call him boring. I guess making interesting standard character combinations can be as hard as making weird ones that work. Very well put, Rakuno 🙂 I agree with you that any combo can be pulled off, even if some feel less natural than others. but isn't that where the interesting part starts? the outlier character, the rebel - there is so much potential for story and personality there! although, as I also mentioned on Chris' blog, I feel this would impact much stronger on RP servers. I've never played on RP servers myself, but I keep thinking I may have missed something here and there. Thanks! Well, Calbry's comment made me think a bit more about the subject and unfortunately it was still maturing in my head when I replied to him. I guess it depends a lot on both cases it depends a lot on how the character is fleshed out. Outlier characters may be easier to do that because by its own nature it already calls attention and raise questions. Why is that character so different? What made him be like that? Then if the answers are good it will keep people interested on the character. But if the difference is just a gimmicky people will notice it and will reject the character. A more traditional character though could more easily dismissed at a fist glance since people wouldn't expect much more depth from them. And a lot of their creators don't bother with it either. But that doesn't need to be necessarily true. One can give some good depth to more traditional archetypes. The problem is to convince people to get beyond the first impressions. I'm a big fan of letting every race be every class, just mechanically. That it's a fun puzzle to come up with role playing justification for it is icing on the cake. I love that sort of creativity. Same! I just prefer the more esoteric combinations although some times more traditional combinations can be welcome too. It all depends on the circumstances, I guess. Edited for small grammar fixes. Some times the fingers are faster than the brain! I'll post a collection of the twitterjustifications on my blog, too. Mostly, it's about keeping it short... since I could spend *hours* writing the fiction, if I let myself. To me the list goes like this: Warrior: Any race (Mine will be human) Engineer: Asura, human, charr (Mine will be asura) Elementalist: Any race (Sylvari) Thief: Asura, human, charr (Asura) Necromancer: Asura, human, charr (Human) Ranger: Sylvari, norn, human (Norn) Mesmer: Sylvari, human, asura (Sylvari) Guardian: Any race (Asura) The only thing that would really bother me is a Sylvari necromancer. A person who is made of plants shouldn't be using undead things to attack his enemies. I used to think about Sylvari necromancer as one of the most strange combination too. Then I thought more about it and came to the conclusion that they are too curious, too young as race to have any bias against it (or anything else). So under that light, Sylvari anything is pretty much acceptable in my opinion.